Really well written, done in verse that explores how despite our differences, no matter where we are, the sun shines on all of us. Vibrant illustrations and excellent, brief descriptions of many different places on the globe make this a great read-aloud, and perfect for any picture book shelf. A celebration all the different people and cultures under the sun from Mary Ann Hoberman, award-winning and bestselling author of the You Read to Me, I'll Read to You series. Throughout history, from dinosaurs and ancient Rome to today's bustling playgrounds and cafes, one thing binds us all together: the sun! 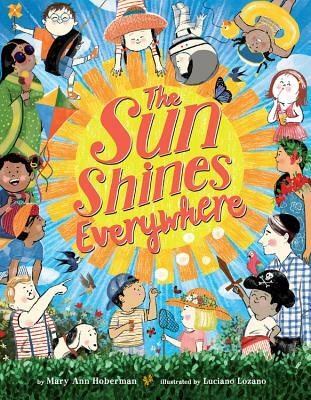 Beloved author Mary Ann Hoberman weaves together timely themes of valuing diversity, building community, and caring for the environment in this rhyming picture book about how the power of sunshine inspires and unites us all around the world. With joyous art from illustrator Luciano Lozano, this perfect rhyming read-aloud reminds us that all life is precious, and all life shares one sun--and the sun shines everywhere! Children's Poet Laureate Mary Ann Hoberman is the author of the classic A House is a House for Me, which won a National Book Award, as well as the bestselling You Read to Me, I'll Read to You and Sing-Along Stories series. Luciano Lozano studied illustration at EINA, Barcelona, where he still lives and works, collaborating with newspapers, magazines, and children's book authors worldwide. This is his debut children's book in the U.S.